Adhesive backed cloth strips attach to inside of circuit breaker box to label all household circuitry. Book contains two pages, or a total of 90 marker strips. Carded. Test for presence of voltage in live circuits. Tests AC/DC voltage from 80-250 volts. The neon indicator glows when voltage is present and brightens as voltage increases. Insulated housing and 2 inch test leads. Built in pocket clip. Tests DC motors, switches and outlets. With detailed user instructions. Replacement leads for Gardner Bender meters GMT-12A, GMT-18A. UL recognized. Tough ABS Plastic. Flexible cords for easy use. 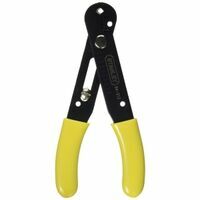 Stanley Wire Stripper/Cutter, Adjustable, 26 - 10 AWG Cable/Wire, 5 in Overall Length, V-Notches Jaw, Oil-Resistant Dipped, Comfortable Grip Handle, Vinyl Handle, Yellow Handle, Forged Steel Body, ANSI Specified Tests for breaks in non-energized wires or cords. 360 degree visual indication. Durable, heavy-duty tip. Flexible lead with insulated alligator clip. Pocket clip. Operates from 2 AAA batteries (included). Contains assorted sizes and lengths of commonly used electrical screws. Screws are #6 - 32, ranging from 3/4" to 3" in length. Compact ergonomic design. Hi-impact ABS housing. Visual voltage indication. 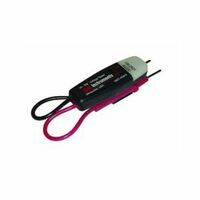 Snap-in leads are spaced to fit a standard outlet for easy, hands-free testing. Tests for voltage at 120 volt, 240 volt, 277 volt and 480 volt. With pocket clip. cULus Listed. 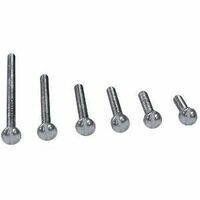 GB Screw Kit, Electrician's, 120 Pieces, Includes: (20) 2/3 in, (20) 7/8 in, (20) 1 in, (20) 1-1/4 in, (20) 1-5/8 in and (20) 2 in Phillips Head Screws, NO 8-32 Phillips Round Head, For Switches, Receptacles and Outlet Applications Drill/tap high-speed steel bit, split point with web thinning. High quality hex shank to ensure strong connection to drill chuck. Complete hole drilling, tapping and deburring/countersinking in one operation with power drill. Designed to tap up to 10 gauge metal. Back taper or deburr/countersink beyond tap to prevent thread damage from over-drilling.